Entre por dentro e fique aí com uma sensação rústica de lodge; Desfrute do lenço de madeira e do bosque que cobre esta cabine. Todas as comodidades de casa estão disponíveis à sua disposição, relaxe e aproveite seu tempo longe da azáfama! Buck Buck Moose é perfeito para lua de mel, casais e famílias pequenas. Localização: Desfrute de uma curta caminhada para a cidade, tubulação, tirolesa, restaurantes, degustação de vinhos, compras e muitas outras atividades. A cabine tem uma cama queen no andar de baixo e uma cama queen no loft, ambos colchões de 1 ano de idade. Também o futon poderia dormir 2 crianças ou 1 adulto jovem quando dobradas. Quando o seu dia acabar de cozinhar na grelha e prepare-se para relaxar na banheira de hidromassagem com algum vinho local da Geórgia ou sua bebida favorita. Nós adicionamos uma fogueira ao ar livre para desfrutar de um tempo familiar ao redor de um incêndio no campo. Nossa família possui a cabine ao lado que pode acomodar um grupo maior ou múltiplas famílias com a conveniência de estar muito perto. Isso pode exigir a reserva com até 60 dias de antecedência, conforme as duas cabines reservam regularmente. We came for second half of spring break, and spent 3 nights at the Buck-Buck Moose cabin. 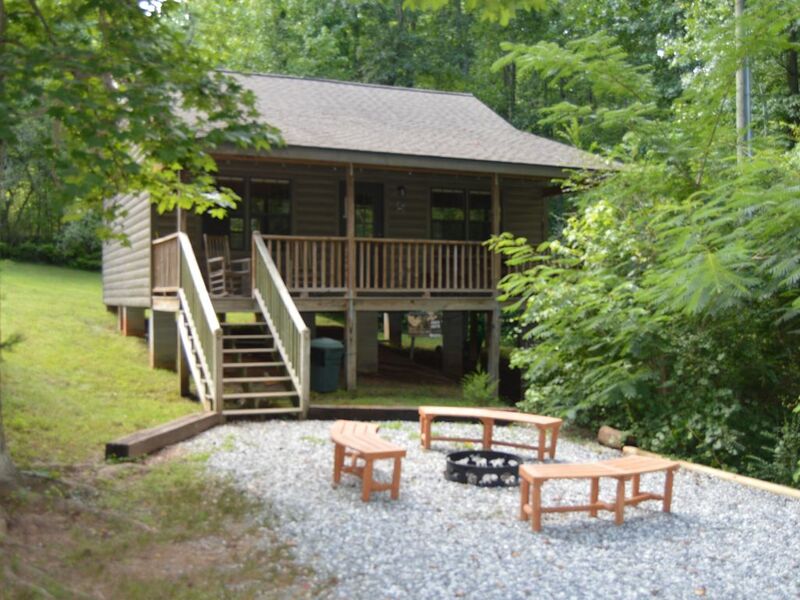 This cabin is in Helen, and roughly a 20 minute walk from the downtown area. The cabin itself is very cozy with queen bed in the loft upstairs and a queen in the downstairs bedroom. This is a great place if you are looking for a little bit of woods that is not far from town. We spent a good bit of time outside, hiking and fishing, and enjoyed the wrap around porch in the evenings. One thing you should know is that the front porch looks across the driveway at the neighboring cabin. Amenities inside were very basic but sufficient. We ate all of our dinners at the cabin, and made good use of the outside grill. The owner did a great job with prompt and helpful communication. Overall it was a pleasant stay and fit our needs just fine. It was a blast! A beautiful cabin and loved it! We loved our stay! The place felt homey and the jacuzzi was a nice touch. There are even horses across the street that we fed everyday! My 12 yr old loved having the room upstairs to herself, and I loved the wrap around porch that I enjoyed in the morning. Only warning is that it is a one car type road leading up to the cabin, but everyone was respectable about aright of way. Also, just a word of advice go shopping before reaching Helen, bc Betty’s is a little high priced and the only grocery in town. Other than that I would definitely recommend! My wife and I rented for a weekend get away. The cabin was perfect for our needs. Very clean, kitchen was well equipt for a rental, and is in a good location close to Helen. Great cabin , Helen never disappoints!! Very nice cabin on hillside off the main strip of Helen. Makes you feel you are farther into the woods than you really are. The cabin was clean, well decorated and comfortable. The owners were easy to get in touch with. No problems whatsoever and I plan to be back! Recommended for couple or small family alike. WiFi and Roku made it easy to settle in after a full days activities and watch a movie if you like. Beds are comfortable and kitchen was stocked with cookware and small necessities like seasonings etc.